In reality, it doesn’t matter if he is or not in one sense. 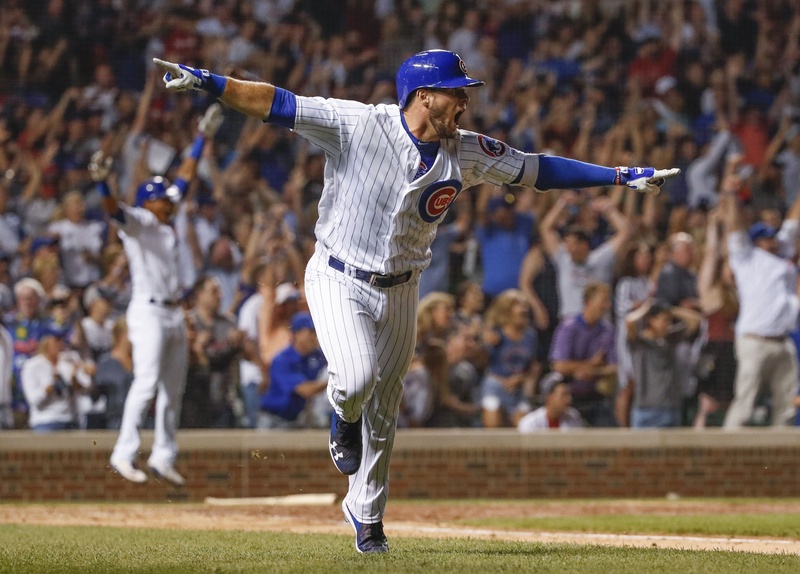 David Bote has provided us all a moment from this season we’ll never forget. The kind of fairy tale that’s so preposterous you really can’t believe it actually happened. Anything that sprung out of your imagination in your living room or backyard when you were five or six doesn’t actually happen in a major league stadium. At least it’s not supposed to. The only way it would be better is if Bote and Joe Maddon had never actually exchanged a word and he was half-asleep in the dugout when Maddon finally turned and said, “#13! Grab a bat!” And then Bote sprang up, couldn’t locate his helmet at first, and held the game up looking for it while the home plate ump and Maddon looked on impatiently, shooting daggers out of their eyes at this rookie. But it’s good enough as it is. Bote’s heroics are only going to raise the number of calls for him to play more, and he probably should. Whether this is the beginning of something long-term or just a guy who can’t stop rolling 7s right now, he’s hot and the Cubs need the juice. The added proclamations that he should replace Addison Russell on the roster for the years going forward… well, we’re not there yet. But is it a possibility? There are obviously things David Bote cannot keep going as we move forward in his career. A .400 BABIP is the main one. Whatever his contact is—and we’ll get to that in a moment—no one’s going to keep that up. So it’s coming down. 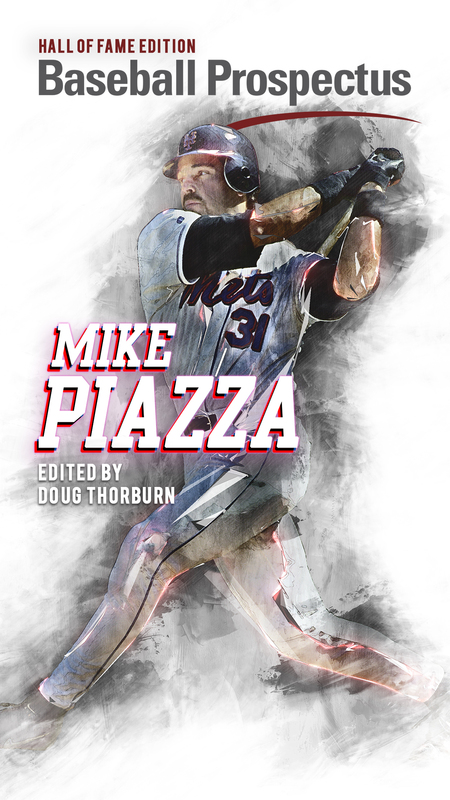 It’s hard to project anyone off just 91 Major League plate appearances. That’s just north of 20 games worth, and as we know anyone can have a nuclear month (even Jason Heyward!). Scouting reports will go out, and they’ll pick at something on Bote until he adjusts. Perhaps that’s why Maddon has shielded him at times this year, to extend the amount of time he remains a mystery to scouts and pitchers alike. That won’t last. But…but…what if it is real? There is something pointing toward that. I.e., David Bote hits the ball really hard. Like, really hard. Again, I can’t stress this enough even though it’s way fun to just leave your inhibitions behind at times and get in a tizzy over a player (love is nice, as Julia Roberts told us), we’re still only talking about 91 PAs. But Bote’s 43.1 percent hard-contact rate is best on the Cubs. It’s ahead of Schwarber and Happ, two players we’re pretty sure are major league quality. His 22.4 percent line-drive rate is still high on the team, ahead of Baez and Zobrist and only right behind Bryant and Rizzo. Again, sample size blah blah blah I will ruin the things you love, but he’s comparing favorably with his teammates. Ok, so here’s the big one: I know everyone’s eyes glaze over when you mention exit-velocity these days. Even the people who invented it get a vacant look when it comes up, given the furor over it. And really all it is is putting a more exact label on what we already knew to be hard contact. Now we know just how hard, but we always knew if this guy hit the ball hard or that guy didn’t. Though he doesn’t really qualify given the dearth of PAs, when you lower to the events he does have, no one in baseball hits the ball harder than Bote. His average of 96.1 mph off the bat leads the league. It’s ahead of Judge. It’s ahead of Cruz. It’s ahead of Stanton. Now, where it gets really silly is that his hard-hit percentage, according to Baseball Savant (basically the percentage of balls he hits that are over 95 mph), leads the league BY SIX PERCENTAGE POINTS! He cracks balls past that threshold at 62.1%, and the next on the list is 56.6%. Obviously, this can’t last. In the Statcast era no one has eclipsed 58%. But even if Bote were to go on a dive for just a while, he’d still be hitting the ball hard as often as just about anyone. And that 96.1 average velocity off the bat isn’t really all that different from the 95 mph average that Aaron Judge has been putting forth. It won’t stay there, but it doesn’t scream major regression either. As far as looking at what Bote has seen thrown at him, the only pitch he’s struggled against is a change-up. 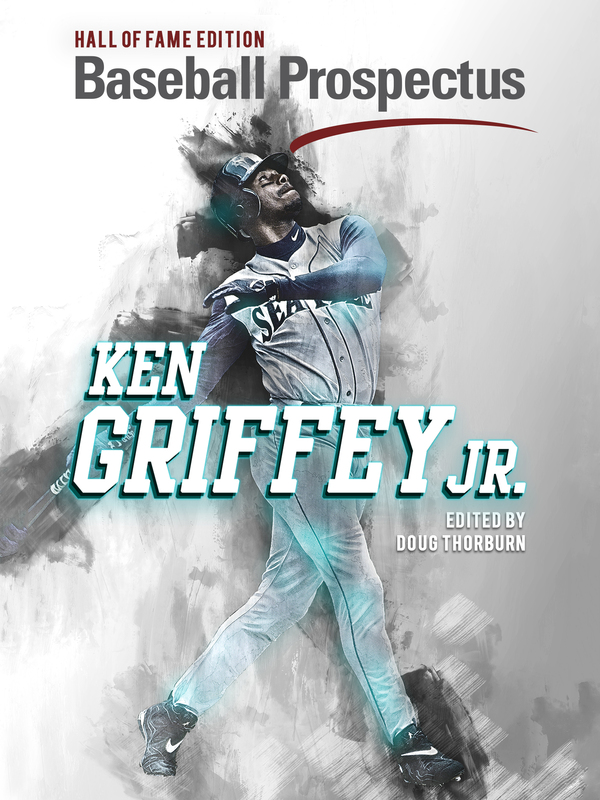 On everything else, he has at least a .250 average, though he hasn’t generated any power against curves or cutters. Yet. Changes have seen him go 1.67, and he can expect more of them soon. But it’s not like he’s completely flummoxed by them, because he only whiffs on 18% of the swings he takes against them. He just beats them into the ground to the tune of an 80% ground-ball rate when contacting a change-up. But as Ryan Madson found out, he can get to balls below the zone and ruin your day when doing so. I would expect Bote is going to see a lot of change-ups and curves low and away soon, and we’ll see if he can get enough of them into right field to bring pitchers back to him. 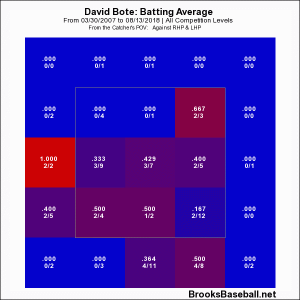 Given just how hard he hits the ball, and how hard he’s hit the ball in the system since he got into it, Bote could be one of those players that just carries a high BABIP. As we’ve discussed with Báez, he’s consistently carried a BABIP over .330 because of how hard he hits the ball when he does. Bote also has the patience that Baez can eschew. And he has shown that at every level. This isn’t enough for me or anyone to declare him the real deal. What we can say is that given just how hard he hits the ball he has a great chance to make up for whatever deficiencies might crop up. And that’s encouraging. Or just go ahead and lose your minds over him, because it’s fun. Because we all dreamt (ha, like it’s past tense) of circling the bases at Wrigley with our arms out because we were actually flying around the bases. We dreamt of screaming as we saw our teammates pouring out of the dugout. We dreamt of rounding third, barely touching the ground, trying to figure out if this is real. We watched Bote live out that dream on Sunday night. Maybe that’s enough. I’m willing to wager there’s going to be more. What is impressive about Bote is that he leads the major leagues in average exit velocity at 98.1, compared to 96.0 for Aaron Judge, who is second. Even more astounding is that he also leads in average generated velocity (in other words, the exit velocity minus the pitch velocity) at 9.8 (Joey Gallo is second at 8.1). Where he differs from these guys is in average launch angle, only 8.0 (Christian Yelich and Franchy Cordero are the most similar hitters). In short, while it is a small sample size, it appears that Bote is a line drive hitter with power.